Well, it looks as though I can’t deny it (or at least doubt it) any longer. The Nastasis have two cats. We, of course, have Missie, our dear inside kitty. She will always be an inside kitty, for I am convinced, after long years of experience, that indoor cats live happier, healthier, longer lives in general. However, a sad story has wandered into our lives, and she appears to have made herself at home. We are taking our lives together (or sort-of together) one day at a time, and no one quite knows where they are heading. I really don’t even have much hope of ever being able to touch her, because although she does not run as far or as fast, she still runs if she sees someone coming out of the house. She shows up on a regular meal schedule now, and is here in the yard most of the day. She is seen wandering up from the barn, and under our front deck. 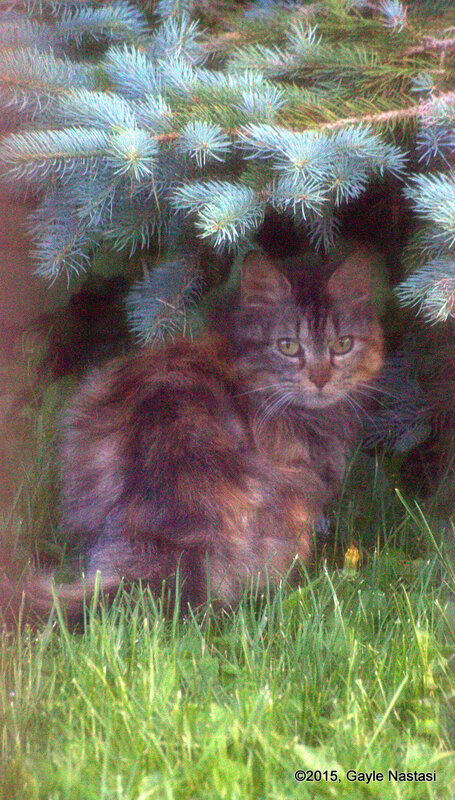 She visits the bird feeders in the back yard, and has even, several times, ventured up on to the porch. We’ve been adopted. We are held at a distance, and she is terribly afraid. Those who rescue animals often talk about the “baggage” they come with. Well, this kitty has brought the whole darned baggage compartment with her, the poor thing. This time (how many strays have we helped now? ), we know for sure where the kitty came from. We know who she is. We even know her name. There was a very nice elderly couple down the road from here; they owned the farm that our own land was once part of. The gentleman passed away a number of years ago, and his wife remained in the farm house. Not too long ago, she sold the farm to a new owner, with the contingent that she could live in the house till she died. She did so, last fall. The lady had, for years, fed barn cats (who now appear to all be gone — I do not, nor do I want to, know where or when or how). She also, it seems, had one indoor cat. Since she was alone much of the time, I am assuming that this kitty was not human-friendly, or socialized in any way, other than to provide companionship to the lady. A couple of months ago, the new owner tore down the old house. It was there in the morning, and gone in the afternoon. About a week later, this kitty started showing up in our yard, hungry and terrified, looking for any kind of sustenance. She helped herself to a couple of birds at my feeders (which was the first sign that pointed to the possibility that we had another stray). Then, I spotted her, and got a couple of long-distance pictures with the telephoto. Suspecting that she may have been one of the barn cats, I showed them to someone who knew the lady. I was told that no, this was not a barn cat; this was the lady’s indoor pet. Her name was LuLu. “LuLu” has gradually (because it just didn’t want to roll off my tongue) mutated to “Luna” much of the time. Or “Lulu-Luna” or “Luna-Lu” or…. She is still sad, but less than she was when she first showed up. She is still terrified, but again, seems to be trusting the location, at least, if not the people. She is, at least, no longer hungry. 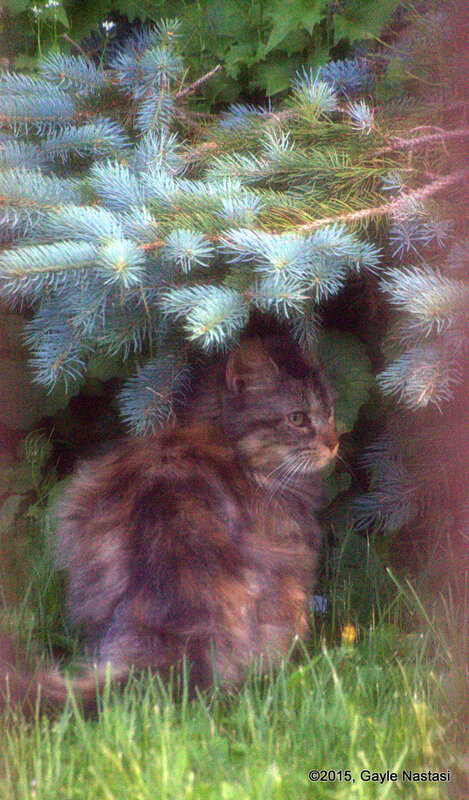 When we (or my hubby and son, now that I’m laid up with a fractured spine) go out to feed her, she now just ducks further under the big spruce tree, rather than running off into the woods across the road in panic. My hopes were to trap, and find some sort of support to help me get her spayed (investigations revealed that the previous owner did not do so), tested, vaccinated. (The cost of the last rescue’s vetting came to over $300, something we never would have been able to accomplish without the help of a dear friend.) My hopes have pretty much been put on hold, thanks to a busted L3 vertebra. They are not, however, abandoned. Once we get over that major hurdle, we don’t know where we will go. Perhaps we will have to settle for making her a cozy place in the barn. With this one, her fears of humans justified as they are, I am not sure she will ever really call us “friends”, and any hope of finding her a home is extremely remote. “Providers” may have to suffice. But Little Luna-LuLu, we love you, anyway. Luna-Lu ventures onto the front porch. But, the photographer has been spotted. Her attention is diverted — will she stay? No, she turns to leave. Perhaps tomorrow.